Zymosan-A is a glucan with repeating glucose units connected by beta-1,3-glycosidic linkages. It is a particulate material prepared from Saccharomyces cerevisiae (baker’s yeast) cell wall and consists of protein-carbohydrate complexes. Used as an inflammatory agent in the Air Pouch Model in mouse or rat, the combination has provided a useful in vivo method of assessing the anti-inflammatory activity of test materials. 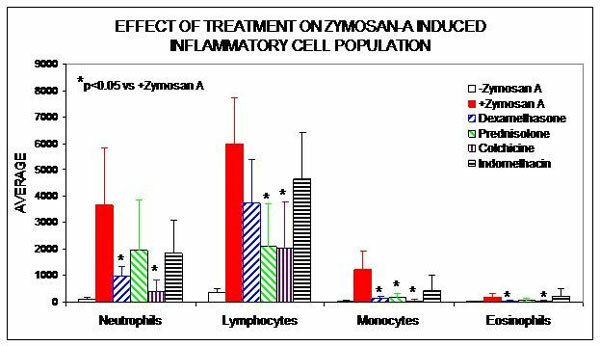 The zymosan air pouch model has been used to provide a practical means of making quantitative measurements of exudative and proliferative components of the inflammatory process, especially in quantifying leukocyte infiltration. It is established as a model for synovial-like tissue inflammation. 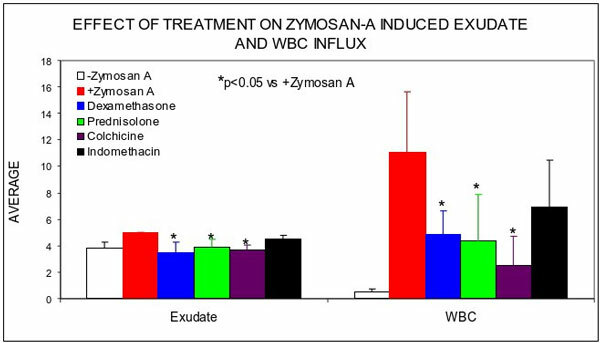 A 1% suspension of zymosan-A is injected into the six-day air pouch. Eight hours later, the exudate is collected and evaluated for white blood cell (WBC) count and differential white blood cell analysis; cytokine content of the exudate can also be assayed by ELISA. Pretreatment with various reference compounds has been shown to be efficacious in reducing the exudate volume and numbers of infiltrating inflammatory cells. 1. Keystone EC at al. Arthritis Rheum. 1977. Sep-Oct; 20(7). 1396-1401. 2. Edwards JCW et al. 1981. 134:147-156. 3. Konno S and Tsusufuji s. 1983. Br J Pharm. 80: 269-277. This model is considered useful for quantitative measurements and biochemical analysis of the inflammatory process in which complement activation plays an important role.